Gettysburg Licensed Battlefield Guide Tim Smith is the co-author of the book Devil’s Den, A History and Guide from Thomas Publications. 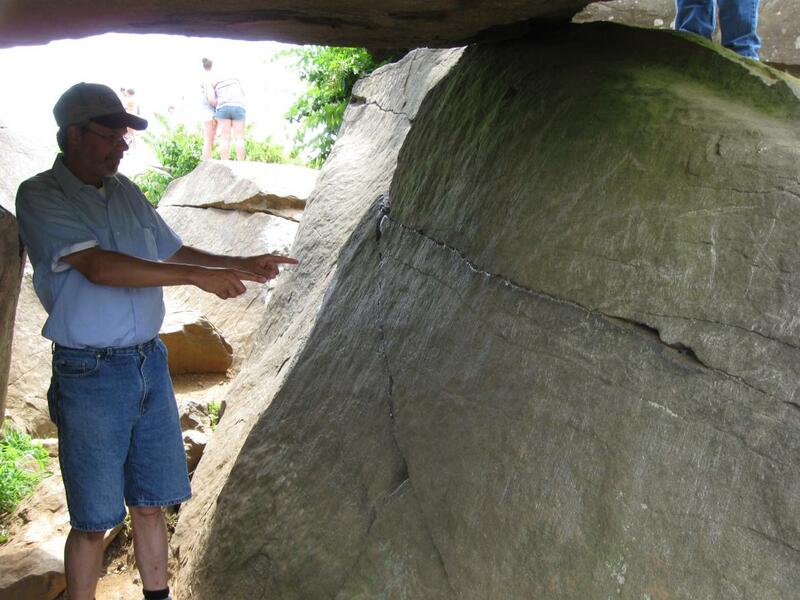 He continues our look at Gettysburg Rock Carvings underneath the “Table Rock” in the Devil’s Den area. This view was taken facing southwest at approximately 3:15 PM on Thursday, July 9, 2009. 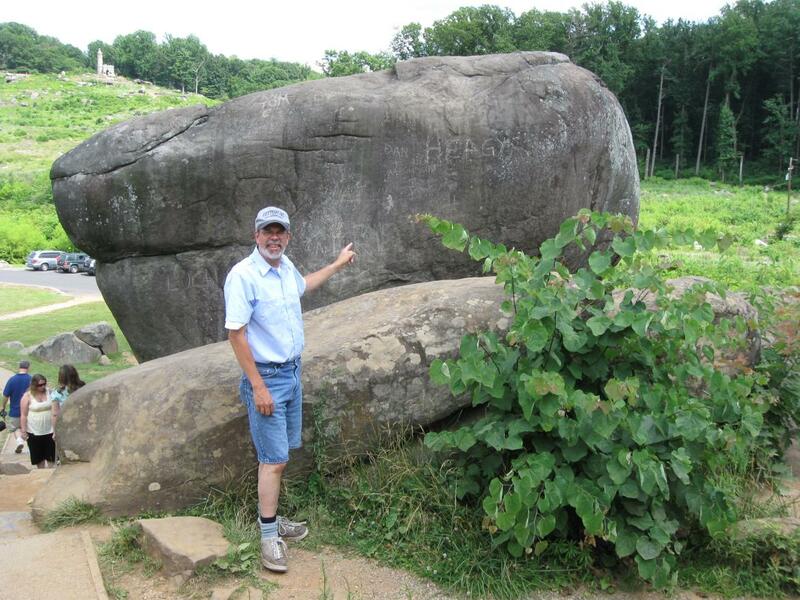 In our first post, Gettysburg Licensed Battlefield Guide Tim Smith began our tour of Gettysburg Rock Carvings at Devil’s Den. 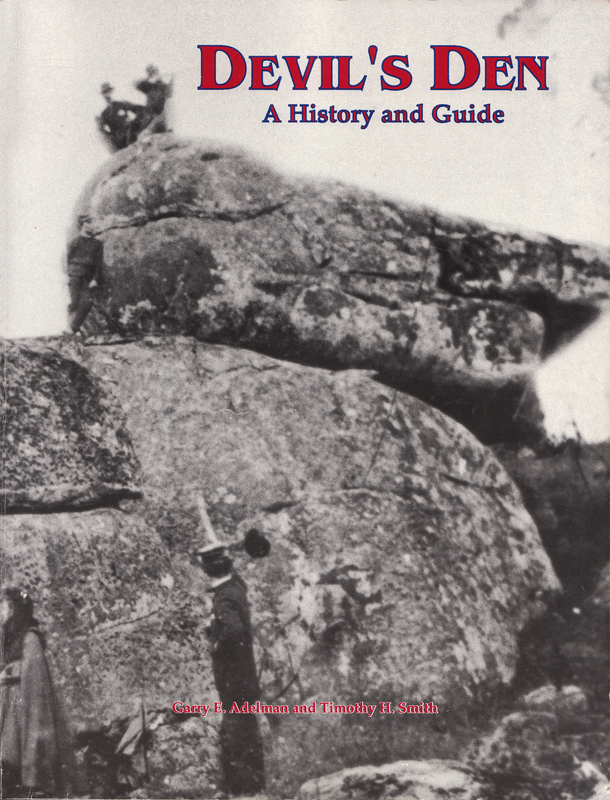 He introduced us to the rock carvings and explained how the government chiseled away many of the rock carvings in 1894. In today’s post Tim shows us more items around the Table Rock area, and how the angle of the sun helps find rock carvings. 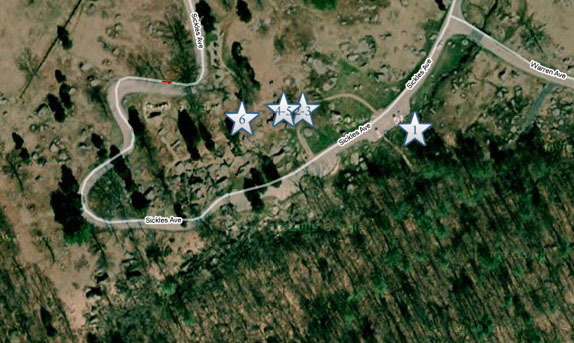 This map shows us the locations taken of videos for the Gettysburg Rock Carvings series. Video #1 was taken in the Slaughter Pen. Videos #2 and #3 were taken in the area of the “balancing rock” or “table rock” at Devil’s Den. Video #4 was taken in the passageway underneath the “table rock.” Video #5 was taken on the west side of the Table Rock. Video #6 was taken southwest of the Table Rock. This map was created facing north at approximately 5:30 PM on Thursday, July 16, 2009. In Video #4 (Videos #1-#3 were shown in our previous Rock Carvings post) Gettysburg Licensed Battlefield Guide Tim Smith is in the passageway underneath the Table Rock and shows us more “scratch outs” by the “government chiselers.” This view was taken facing southwest at approximately 3:15 PM on Thursday, July 9, 2009. Licensed Battlefield Guide Tim Smith has now moved west of the Table Rock to point out the graffiti that has appeared in the last year. This view was taken facing east at approximately 3:15 PM on Thursday, July 9, 2009. In Video #5 Tim Smith shows how graffiti attracts more graffiti, and how from this angle the Table Rock resembles a cartoon character. This view was taken facing east at approximately 3:15 PM on Thursday, July 9, 2009. 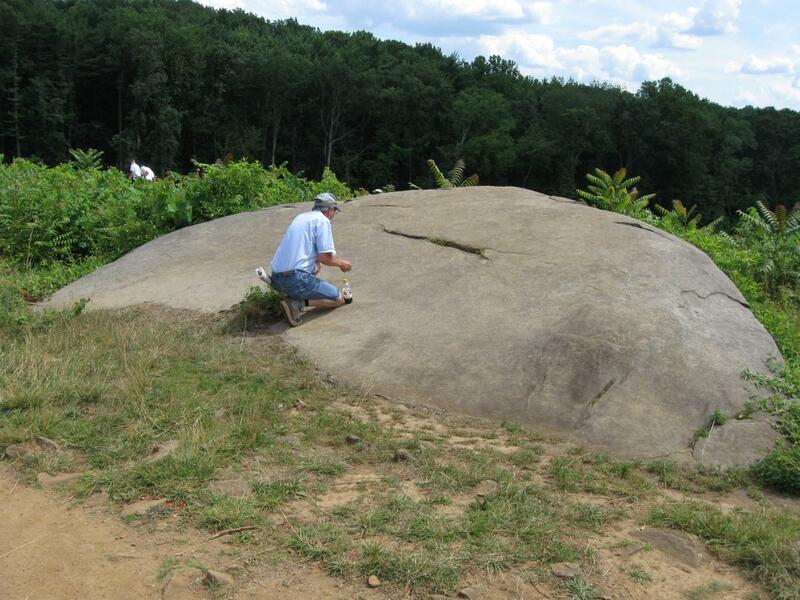 Tim Smith is searching for a John Houck carving on this rock southwest of the Table Rock. This view was taken facing southeast at approximately 3:15 PM on Thursday, July 9, 2009. In Video #6 Tim Smith shows us how seeing rock carvings many times depends on the angle of the sun. This view was taken facing southeast at approximately 3:15 PM on Thursday, July 9, 2009.